★Made of porcelain steel, heat resistant , better toughness and moredurable. The listed models are just for reference, please double measure thesize of your original parts and compare with ours before ordering. Please remember we offer 100% exchange and refund service. If youare not happy with the heat plate for any reason, simply contact us. Thank you! 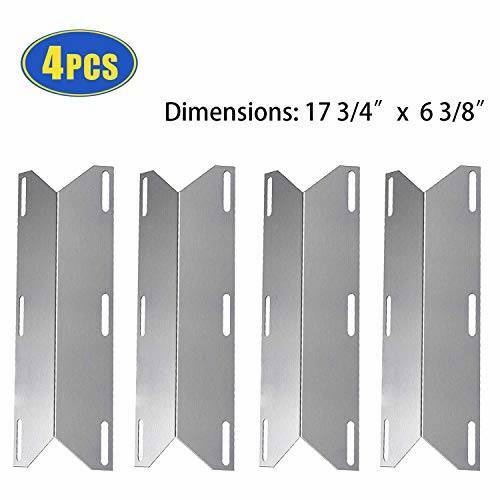 ★Dimensions: 17 3/4 x 6 3/8″, Material: Stainless Steel, Package include : 4-Pack. The grill models listed are just for reference, please measure the sizes of your original parts BEFORE you order.Thank you! ➤ Grill Burner Cover Replacement for Jenn-Air 720-0061, 720-0062, 720-0063, 720-0099, 720-0100, 720-0101, 720-0138, 720-0139, 720-0141, 720-0142, 720-0150, 720-0164, 720-0165, 720-0171, 720-0336, 720-0337, 720-0511, 720-0512 parts. ➤ Gas Grill Heat Shield Replacement for Nexgrill 681955, 720-0026, 720-0061, 720-0062, 720-0063, 720-0099, 720-0100, 720-0101, 720-0138, 720-0139, 720-0141, 720-0142, 720-0145, 720-0150, 720-0164, 720-0165,720-0171, 720-0336, 720-0337, 720-0511, 720-0512, 720-0586A, 720-0671, 730-0337, 738505 parts. ➤ Grill Heat Plate Replacement for Glen Canyon 720-0026 and 720-0145 parts. ➤ Replacement for Kirkland SKU681955 and SKU738505 parts. ➤ Replacement for Sterling Forge Chateau 3304 and Estate 2704 parts. ➤ Replacement for Members Mark 720-0586A parts. ★ Your grill burner covers maybe rust and wear out after a certain amount of time. We know you would prefer to keep your favorite grill running rather than throw it out. It is time to replace your bbq heat shields and save the cost of a new grill! You will get your grill work like new with our replacement grill burner shields at a fraction of the cost of OEM parts! Prevents flare-ups and protects burners to prolong life, Prevents direct exposure to flame and distributes heat evenly.